Now back in those days I am describing—when there were no chain motels, no cookie cutter places—we had to make decisions about where to lay our heads at night. When Dad grew weary from driving, he and Mom would scan the shoulders of the road, especially near cities or in little towns. They looked for lodging. Big ribbons of neon helped them make their choice, as did the signs that said refrigerated air, free ice, and a few years later boasted of free TV. After Dad finally pulled into a motel Mom already was doling out her advice even before he’d cut off the engine. She always told him the same thing. You could count on it. She’d turn to dad and say, ”Please go look at a room first and make sure everything is okay.” That was her code for being sure the rooms were clean and not overrun with roaches. Dad would go into the office and be gone for a while and then he’d come back and announce, “It’s a good place.” I cannot remember one time ever when he came back and said it wasn’t good. Not once. I also recall some of his choices were borderline or maybe over the line but Mom let it pass and we all survived the night. I witnessed this ritual hundreds of times during the 1950s and early 1960s before I left home for the Marines and college and to make my way in the world. I still have memories of many of those grand old motels where I stayed as a boy or later when traveling the Mother Road or one of our other historic highways. I can see the crinkly paper on the water glasses, the bedspreads with embroidered bucking cowboys, the bottle opener mounted on the door frame, the pastel colored tile in the bath. Some of my favorite motels were in Oklahoma. From Quapaw to Texola, I have had occasion to check into some of the old road’s best and a few that need a little help. In Oklahoma — with 410 miles of old highway, more Route 66 miles than any of the eight states it flows through — far too many motels are derelict or abandoned. Many of these properties have become junkyards, car lots, or flophouses. Many owners simply do not care. They would rather sell the properties to a developer to build yet another strip center or a chain eatery. Today at least 3,000 motels along the entire route in all eight states are in various states of repair or disrepair. This has to stop and has to stop now. Right now. 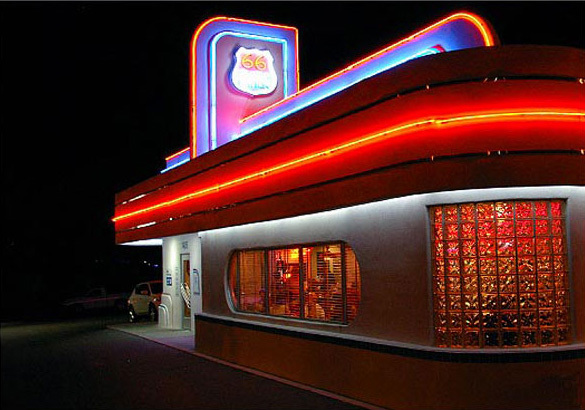 We cannot save them all, but by God we have to save at least examples of the motels, cafes, curio shops and other commercial archaeology from all the layers, all the incarnations of Route 66. We owe it to ourselves, to the public, to the many travelers who flock to the varicose old road. We owe it to our kids and grandkids and to future travelers. Remember that this highway— including the long stretch running through Oklahoma — is a true mirror of the nation. Like all roads, Route 66 and what takes place on it reflect our society and culture. That includes the good, the bad, the ugly, the holy, the shades of gray, and the cold hard truth of life. That has always been the case. That has always been a fact. That will never change.